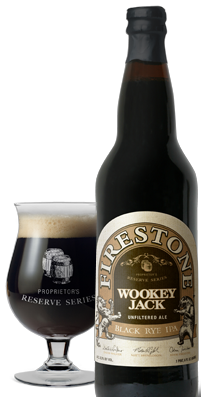 As the latest addition to Firestone Walker’s Proprietors Reserve series Wookey Jack, an unfiltered black rye IPA clocks in at 8.3% ABV. While many black IPAs (Cascadian Dark Ales or American Black Ales) have been released over the past few years, nowadays breweries have begun to put their own twist on this new style in order to stand out as much as possible. The primary challenge in brewing a well executed black IPA is the achievement of a delicate balance between the assertive hop character of an IPA and the roasty flavors of darker malts. In the case of Wookie Jack, Firestone Walker’s brewers put together an ingenious blend of “pale malt, malted rye, a dash of cara-rye, Midnight Wheat, and de-bittered black malt.” If I’m correct in my analysis of the grist, the brewers made sure to choose specialty malts that would not only create unique flavors when combined, but also highlight the hops by not contributing roasty bitterness or astringency. As a bittering addition German Magnum hops were used to add some earthy and spicy bitterness. Then following in true west coast style Citra and Amarillo hops were used as flavor, aroma, and double-dry hopping additions in order give Wookie Jack its juicy citrus forward aroma and hop character. Wookie Jack poured opaque black with a one finger khaki head that quickly dissipated and left a significant amount of lacing on my snifter glass. True to its double-dry hopping the aroma drew me in with pungent grapefruit, passion fruit, and orange notes that were supported by hints of chocolatey and toasty maltiness. From the aroma I expected a bitter hop bomb, but that was not the case. However, in true Firestone Walker fashion the flavor profile that met my palate with each sip was complex yet balanced. The hops were dominant yet restrained in that they contributed sweet juicy flavors of grapefruit, orange, and mango, but did not overwhelm my palate with bitterness. The Magnum hops came through at mid palate as bittersweet chocolate, toasted bread, and spicy rye notes were met by moderate earthy and piney bitterness. In fact as the beer warmed up, the spicy and earthy flavors became increasingly apparent and reminded me a bit of beers agedon cedar wood. The finish also changed a bit in that I picked up some notes of orange and apricot marmalade and the rye and toasty flavors lasted longest between sips.